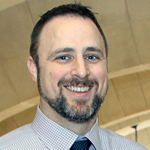 Patrick is an Electronic Resources and Reference Librarian as well as an Adjunct Professor at UConn School of Law in Hartford, Connecticut. Patrick is responsible for maintaining and developing access to electronic resources, administering the integrated library management system, and exploring and implementing relevant and emerging technologies. Patrick also provides reference, research, and educational services to the law school community. He received his J.D. from the UConn School of Law and an M.L.I.S. from St. John’s University.